A recent piece arguing that Hiccup’s mom is a “weak” character ignores everything that makes HTTYD 2 subversive and transformative. She’s wise. She’s principled. She’s joyous. She’s divided. She’s damaged. She’s vulnerable. She’s something female characters so often aren’t in action/adventure films with male protagonists: She’s interesting. Too bad the story gives her absolutely nothing to do. . . . Valka is just the latest example of the Superfluous, Flimsy Character disguised as a Strong Female Character. 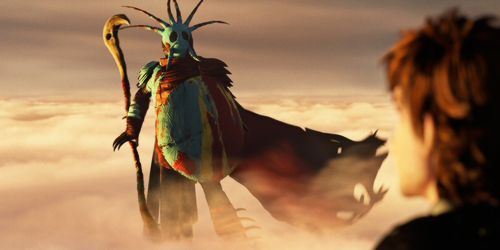 The essay goes on to allege that Valka is weak at several crucial moments in the plot. Specifically it paints her as a damsel who needs rescuing in the third act. It also goes on to give a list of other characters who fail by this standard, including the much-loved Pacific Rim character of Mako Mori. Tumblr user quigonejinn has a compelling post explaining how important Mako Mori is from a cultural perspective, written in response to the existence of the Mako Mori test. how DARE this woman of color have the unmitigated gall to show vulnerability and make mistakes and be supported by other people? . . . .
how dare she not be an invincible dragon lady who nevertheless sacrifices herself to rescue her white dude savior??? It’s important to recognize the way the Dissolve has reframed the narrative of Pacific Rim in order to recognize that that’s also what it has done to the narrative of How to Train Your Dragon 2. Ironically, it’s HTTYD 2‘s reframing and rejection of die-hard sexist Hollywood tropes—specifically the one about “fridged women” being used as fodder for manpain and male-centered violence—that makes it unique in the pantheon of children’s films. There are full spoilers for HTTYD 2 from this point on, so be warned. Five minutes into this film, which opens with Hiccup rejecting his father’s wish for him to be the new village chief, I was muttering, “Make Astrid the new chief, make Astrid the new chief,” under my breath. I mean obviously that would be the best possible solution to everyone’s lives, right? But because this is Dragon Rider, not Whale Rider, we got a standard narrative about Hiccup’s expanding heroism—sort of. The unique thing about Hiccup’s character in this film is that it doesn’t actually undergo any, well, development. While the narrative stresses that people can change, Hiccup himself doesn’t actually change all that much. But that works for this film, because How To Train Your Dragon 2 is less a traditional coming-of-age arc about a single character learning to accept responsibility and find his place, and more a collective arc about an entire community evolving and changing together. As a character, Hiccup is, perhaps, one of the most feminist and progressive male heroes in film history. He’s a character who consistently rejects, over and over again, the idea that violence is ever a solution in situations of conflict. He’s a character who actively practices empathy and, of course, active conservationism. He’s a disabled character who not only adapts to his disability without ever losing anything that makes him amazing, but sees it as a thing to be proud of, to celebrate as something that makes him special and gives him more in common with his best friend. Meanwhile, while Hiccup is going on a discovery quest, his female counterpart Astrid is busy rejecting orders and doing her own thing. After Hiccup’s failed first and second attempts to try to find the villain Drago, he gets sidetracked by his encounter with his mother and lapses into inaction. Meanwhile, Astrid makes the totally independent decision to enlist the dragon trappers’ help and/or follow them to Drago. Without that action, Team Peace might never have actually encountered Drago, the plot’s third act might never have gotten underway, and Eret would never have switched sides to help free the dragon riders and defeat the bad guy. As an aside: how much chemistry did Astrid and Hiccup have together? When was the last time you saw a romantic couple in an animated film have that much casual touching and body interaction that wasn’t a deliberate setup for a meet-cute? Maybe Shrek? Maybe never. It was great. Female sexuality is never shamed or repressed in HTTYD 2. Additionally, as ladygeekgirl points out in her smart take on the film, the women of DreamWorks, unlike the women of Frozen, actually have faces that are different from one another. Not only do each of these women have individual faces, they also each get their own promotional movie poster for the film—another “when was the last time…?” moment for DreamWorks. This brings us to the film’s treatment of Hiccup’s mother. In absolutely every other Hollywood version of the HTTYD 2 narrative, Hiccup’s discovery of his mother’s two-decade-long absence would have resulted in an explicit shaming of her choices and a prolonged “how could you abandon me?” confrontation that would probably have ended with her breaking down in tears and Hiccup’s eventual acceptance and forgiveness of her inexplicable absence all this time. Additionally, the film totally validated her life choices by making her caretaker of the coolest free-range dragon park ever, and presenting the choice to rejoin her family as a choice that would validate all of her earlier choices to leave them behind. In absolutely every other Hollywood version of the HTTYD 2 narrative, Hiccup’s mother would have been briefly united with her husband and son, only to die tragically in the next big battle, thereby giving them extra manpain and creating more fuel for their ultimate avenging of her death. In absolutely every other Hollywood version of the HTTYD 2 narrative, it would have been Valka sacrificing her life for that of her son instead of Stoick. Let’s call it the Lily Potter Syndrome. But instead, the film actually showed how damaging the trope of killing off the dead woman for more manpain really is, by using her earlier presumed death as the catalyst for all Stoick’s misplaced vengeance against dragons. We know how wasteful and wrong that misplaced anger is because the first film worked through it at length. Additionally, instead of going on a vengeance quest after Stoick’s death, we see Valka and Hiccup both rejecting the idea that such a motivation for violence would do anything but bring them and their homeland of Berk more pain. To the very last scene they’re in together, Hiccup is trying to reason with Drago; every one of his actions is done from a position of non-violent communication. That recognition is absolutely central to any kind of effective reading of How to Train Your Dragon. This is literally a franchise which has taken the most notoriously war-mongering stereotype in existence, Viking culture, and gradually transformed it until the characters not only refuse to use violence as a solution, but proudly proclaim that they are a “land of peace.” That’s an unbelievably radical and transformative narrative for a Hollywood film to deliver, much less a Hollywood children’s film. The HTTYD franchise now joins Avatar: The Last Airbender as one of the only animated franchises to commit this deeply to such a polarizing political stance. Dissolve’s essay seems to completely overlook this aspect of HTTYD 2. At no point are the male characters aggressors against Drago. Although they talk about it, they never actually act violently except to defend their home from capture. In fact, the only person to attack Drago first is Valka, who hits him weakly out of anger after watching her giant bewilderbeast get killed. And despite what the Dissolve essay speculates, it seems evident that Valka has never really physically fought with Drago herself. When the time comes to actually physically attack, she gets no further than poking him with her stick a few times. Valka was never intended to be a serious physical match for Drago, nor should she have been, because the whole point of her character aligned with her son’s is to personify the Viking nation’s progressive anti-violence stance. Sorry that Valka was too busy working as a zoologist to become the vaunted warrior-hero-soldier that apparently makes a female character strong enough for you, Dissolve. Instead, she spends years subversively rescuing dragons from capture like a radical Greenpeace activist, and she is the one who leads the enormous dragon army into battle against Drago. And come to that, when was the last time you saw a mother and son riding side-by-side into battle together? Another point for you, DreamWorks. While it’s true that she gets rescued by her husband, so does everyone else in her family. They spend the movie running around trying to protect each other: Stoick saves Hiccup, Valka, and Hiccup again; Valka saves Toothless, Toothless saves Hiccup, and then Hiccup and Toothless save everyone. Even more significantly, while it’s true that she doesn’t get to do much in the third act, she doesn’t have to. She doesn’t have to because unlike 90 percent of other Hollywood films, HTTYD is a universe with more than one woman in it. And as a result, it gets to have a variety of women who do a variety of different things. Valka doesn’t have to be an all-powerful warrior-soldier, because Astrid and Ruffnut are out there dumping flaming sulfur on the enemy and generally proving that women can be badasses on the battlefield. Valka proves that women can be badasses as activists and scientists and even, yes, as moms, too. Dissolve’s reading of HTTYD 2 completely misses the multiple ways in which the film is trying to avoid the reductive trope that the only strong characters are the characters who fight. By insisting that Valka is weak because she falls down and has to be rescued by her husband, Dissolve is failing its own measurement of strength, considering she’s the only character who actually is the aggressor against Drago at any point. But moreover, it’s failing to consider the film’s entire point, which is that violence is not the way forward, and that humans and dragons need to rescue each other. Ultimately, what expands in How to Train Your Dragon is not the central character’s growth and understanding, but that of the entire world. Hiccup shifts from exploring and mapping out the physical world of the film to actively uniting the people who live in it. His mother, who by all narrative trope standards should have been killed off in an act of self-sacrifice at the end of act two, instead finishes the film seeing her life’s work come to fruition in ways she never thought possible. As a narrative of female empowerment, we find this pretty damn satisfying.